The narrow medieval streets full of colourful old buildings make a fantastic backdrop for another stunning collection of 20 new quilt designs from Kaffe and his chosen team of designers. Kaffe brings another collection of sumptuous new fabrics to patchwork enthusiasts, showing them how to create his wonderful harmonies of colour in exciting new ways. 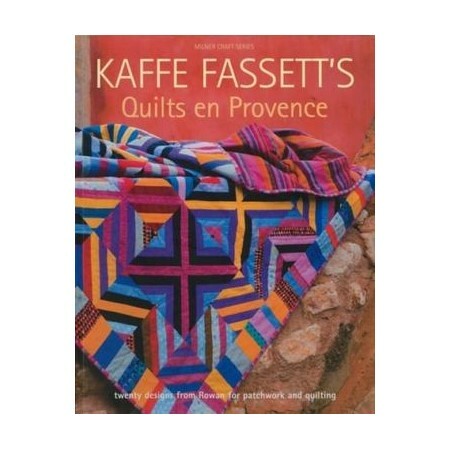 Kaffe's way with patchwork is not about about tricky piecing but always about the joyous use of unexpected colour stories. Because of this, the quilts in this book show how traditional piecing can be newly interpreted with a modern twist. This time, Kaffe highlights the work of fabric designer Philip Jacobs in his Designer Profile, whose collections are a mainstay of Rowan fabric's success. Philip has an international reputation for designing wonderful floral fabrics for major furnishing houses in the U.K. His love of natural forms and oriental art inspired him becoming a textile designer, so when Kaffe invited him to design patchwork fabric for Rowan he jumped at the chance. As always, the book introduces the new range of fabrics from Rowan, with a gallery of the 20 quilts shot on location, followed by a full shot of the quilt for reference purposes, with the ingredients list of fabrics and full written instructions illustrated with coloured diagrams. Templates for the quilts appear in the appendix to the book.